SANTA CLARA, California, October 31. THROUGHOUT my entire career, I have struggled to understand proper hand position during the entry and initial catch in swimming. I know, one would have thought after swimming for 20 years, having taken graduate courses in biomechanics, anatomy, and orthopedics, I should have mastered this seemingly simplistic subject. In fact, one would think hand position and orientation as elementary swimming subjects that any novice swimmer has mastered. In all honesty, some of these athletes probably have mastered and can articulate the "ideal" hand position, but this article is for everyone who has been struggling with improper hand position and bubbles flying off their hands throughout their career. Swimming requires a unique balance of optimizing propulsion and minimizing drag. Both of these techniques must be achieved for optimal swimming velocity. If drag was the only factor, then any 50-pound swimmer could speed down the pool. If propulsion was the only factor, then any bodybuilder would dominate the sport. Therefore balancing propulsion and drag is essential. Everyone knows how important hand position and orientation are for optimal swimming, unfortunately not everyone does it correctly. The term is often associated with the mythical "feel" terminology commonly associated with elite athletes. The metaphysical state deals with how the hand interacts with the water. This series should help those understand hand position/orientation, grasping "feel" in the water. Every athlete of every age idolizes greatness. This is true in swimming, as every novice swimmer watches elite swimmers and mimics their stroke. Don't use videos of Olympians as a standard for teaching swimmers. Olympic swimmers typically have unrealistic range of motion and strength and it is unreasonable to ask novice swimmers to perform the same task without the same tools. I'm not suggesting never using a video of an elite swimmer to help a novice learn a subject, but exact duplication is an unreasonable task. Also, some of these athletes don't have the right form to begin with, they have enough talent, genetics and "feel" to do improper movements and get away with it….unfair I know, sit back down and deal with it! 1. Weekend warrior and Masters athlete: These athletes did not swim much as a youth and often exhibit decreased range of motion and strength. 2. Youth athletes: Often have proper range of motion, but have strength and kinesthetic deficits. 3. Elite swimmers: Could have strength, range of motion, strength or kinesthetic deficits, but harder to determine secondary to ability to "fake" the movement due to their talents. While teaching these swimmers, I am more cavalier pushing the limits of force production with the third category. For the first two categories, I'm focusing on the basics, accepting limitations between the parties and dealing with the working parts available. This is not only a problem with entry and hand position, but swimming biomechanics. One size fits none! Sure there are commonalities — crossing over, extreme shoulder internal rotation and pinkie finger entry, for instance — that you never want to see during freestyle, but that's not to say that there won't be biomechanical differences between swimmers. These differences are due to the athlete's body type and anthropometrics. For example, a swimmer with a straight arm recovery will need more wrist flexion to achieve a clean entry. Injury history and functional limitations should also be considered. If the athlete has a history of shoulder pain, then they may have poor proprioception (joint position in space) of the shoulder. This inhibits the swimmer's ability to feel where their shoulders lie. If the athlete has poor shoulder proprioception, then they will have difficulty identifying the exact location of their more distal hand. For these athletes a more distinct scapular stabilization and retraction may be needed to control the position of the hand. I'm not saying that this is the most efficient or optimal form of swimming, but may be the best option for swimmers with these limitations. You need to address this issue and determine if it helps the limitation at hand (pun alert!). Paddles are used frequently in swimming. This allows athletes to improve their forearm/shoulder strength and increase shoulder internal rotation. These facets are mandatory for elite swimmers. Unfortunately, paddles allow swimmers to have their hand (more specifically their fingers) in any orientation during the entry and initial catch while still grabbing water. This can lead to poor habits. One may argue, a swimmer must orient their hand/forearm toward their feet during the mid-catch of pulling; therefore hand orientation is not irrelevant with pulling. This is a valid argument, but one can still go fast with hand and forearm flaws. Want to know a secret…the bigger the paddle the bigger the flaw you can get away with. This is why many swimmers that use elephant-sized paddles and exhibit shoulder pain, they are feeding into their stroke flaws, but compensating with larger paddles. I will probably get some remarks on my views of paddles, but I think they are used too often by swimmers with poor strokes. Clean up the strokes, and then move onto paddles to help improve the aforementioned techniques. This is a case of passing on a belief, just because you were told so or you did it yourself, think for yourself! One form of paddles I do advocate for all swimmers are finger paddles. Finger paddles require proper entry and initiation with the finger tips during the catch. These tools can help the all three categories of swimmers. Finger position is a hotly-debated subject in the world of swimming nerds (all of you readers, that's a compliment). A study reviewed more than a year ago determined that swimmers should have their fingers approximately 0.32 cm apart for optimal propulsion (finger spread and propulsion). That article was excellent and compared propulsion between a cupped hand, fingers slightly apart (0.32 cm) and fingers far apart (0.64 cm). It was great to see a piece like this studied (props to Marinho and his Portuguese team). However, what the heck is 0.32 cm? This is too specific and unless you swim with a ruler, I doubt anyone swims with 0.32 cm finger separation. Moreover, the distance between the fingers is highly dependent on the speed their hands in water. The faster an athlete moves their hand through water, the greater one should have their fingers separated, because the athlete's hand will become tubular and "recognized" as a whole object. Another note to mention about finer position. Many swimmers to have all their fingers together, it is unnatural. Next time you're on deck look at everyone's hands. I guarantee their fingers are slightly apart and their thumbs somewhat to the side. I feel this hand position is close to the optimal position for swimmers. This natural position will help relax the hand and conserve energy, compared to a forced, unnatural hand position, such as having all the fingers together. Gary Hall Sr. does a group job explaining this subject in this video and he gives a good test to determine optimal finger distance and bear claw pulling. When I was a child everyone told me, "Your thumb is not a finger." For this reason, I am separating the thumb from problem #5. As mentioned in the Gary Hall Sr. video, he, Eddie Reese and other elite coaches suggest using a "bear claw" finger position. This includes the thumb being kept outwards. I feel this is essential and often times forgotten or taught incorrectly. A topic I have never heard discussed pertaining thumb position is distal interphalangeal joint (don't worry, in English this is the distal aspect of the thumb). 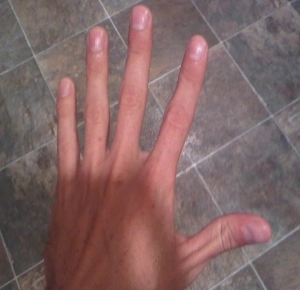 Many people have what is commonly called "Hitchhiker's Thumb". This means the thumb has natural extension when full extended. This can lead to improper catch and many "bubbles" or eddy currents off the thumb during the catch. It is important to have the distal interphalangeal joint in neutral or slight flexion. This will require a lot of focus for the swimmer, since they have likely never thought about their thumb position. However, if you point it out to them and have them take a few "sneak peeks" at their thumbs during their catch, they will able to see all the bubbles flying off their hands when their distal thumb is extended. Have them try different positions, monitoring the amount of bubbles at the thumb, then let them choose the one with the least bubbles, this will be the most propulsive. Straight arm recovery is becoming more and more popular in the sprinting community. These anaerobic beasts use a straight arm recovery to improve their distance per stroke while achieving an early vertical forearm sooner, increasing the distance their arm will catch water. During the entry, a swimmer using a straight arm recovery will need a higher amount of wrist flexion compared to their bent elbow recovery to ensure minimal water resistance at the entry. For example, the farther your reach with your arm, the flatter your arm will be, however one still needs to have their fingers enter the water first. If you are using straight arm freestyle, you have less elbow flexion and need to obtain a finger entry first by increasing your wrist flexion. Many people neglect this issue and it leads to water clapping and seal swimming. This increases the amount of drag and decreases velocity, no fun. Flat or cupped, which hand orientation should one use… Simple answer, flat with slight cupping. Flat hands have a larger surface area and allow an athlete to have a higher force production by obtaining leverage during their initial catch. 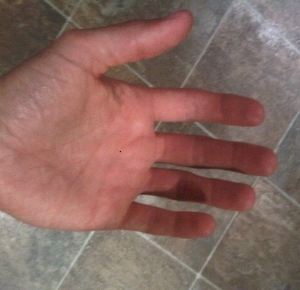 However, having a completely flat hand is slightly unnatural, requiring more energy expenditure. Experiment with different positions, but remember the bigger the hand, the higher potential propulsion. I'll be brief with this subject because I'm working on another piece completely dedicated to this subject. 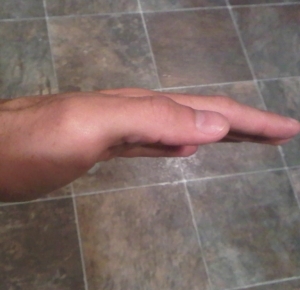 If an athlete enters with his/her thumb, the whole hand can enter through a smaller hole, decreasing drag. However, many athletes achieve a thumb's first entry through shoulder internal rotation. This orientation can stress the anterior structures of the shoulder and increase the risk for shoulder impingement. Luckily, the thumb first entry can be achieved with no movement at the shoulder. Instead, instruct your athletes to use forearm pronation (rotating the forearm inwards) instead of shoulder internal rotation to get their thumbs to enter first, decreasing the amount of drag on the entry. "The other old-school habit that bothers me is what I call the modern-toilet-seat-syndrome. Most of us have seen these new toilet seats that have a spring that slows them down and keeps them from slamming against the toilet when dropped. Many swimmers I teach enter their hands into the water just like these new toilet seats. They slow down the arm just before the hand enters the water, hoping to avoid all of those terrible air bubbles they've heard about. The problem is that by slowing their arm recovery and the hand entry, their stroke rate slows and they seem to get just as many air bubbles as when they let their arms rip and throw their hands forward aggressively. The ability to get rid of those nasty air bubbles has more to do with what one does with the hand after it gets into the water and the sensitivity in the finger tips than it does with the speed of the hand as it enters the water. So forget about being delicate. Let your arms rip through the recovery with relaxed wrist and hands. Enter the water with full extension…or close to it. Then get ready for another good underwater pull with a high elbow, feeling the water as well as you can." Ponder these 10 problems during the next week and when I return you will have more underwater and hand/finger pictures/videos to satisfy your obsession like the Hamburgler.